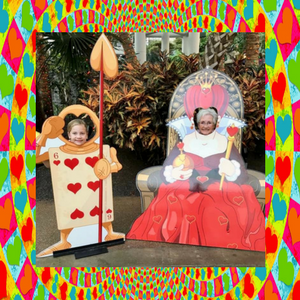 The hotel was decorated for Alice In Wonderland, but "500 Miles" felt like the real theme at NCHC Nationals over Labor Day weekend. Dancers and spectators alike met their step goals for the day! The only exception might be Joel Harrison, who zipped around on an electric skateboard contraption! In addition to all the steps counted to walk from guest rooms to the competition ballrooms, many dancers had to shuffle between ballrooms all day, since Amateur categories were held in the Presidential Ballroom while Master categories took place in the Delta Ballroom. Teammate Molly and I arrived at the hotel Friday afternoon and spend the day saying "wow" as we explored the place. Molly blew out her flip flop (Apparently this does happen to folks other than Jimmy Buffett! ), so she walked around in socks until she found a replacement in one of the gift shops! Easy enough - found them in the 2nd store we entered. Laura gets my vote for team MVP! Despite being unable to dance due to an injury at our final practice, she showed up to cheer us on AND managed to save the day! Apparently, she argued with her driver and INSISTED on bringing her already-packed garment bag. When a dancer couldn't find her yellow belt, it was Laura to the rescue! Yellow belts for everyone except Dustin! Fancy Free Cloggers brought a sizable cheering section of loved ones to this competition. Jim's son even made the trip from Alabama! He followed the program carefully and always knew which dances were going out of order. He cheers for EVERY TEAM. If you danced in Delta Ballroom that day, Jim Jr. clapped for you! So many excellent routines to watch! TNC Elite's "Stand By Me" was one of my personal favorites, along with "Forty-Hour Week" by Southern Belles. NCHC Nationals ran smoothly, thanks to workers like Mr. Reed Davis! He was backstage making sure teams lined up in correct order and he always had a smile to calm our nerves. Mr. Davis has been part of this clogging competition for 30+ years! THANK YOU! Judges and dancers alike adopted a laid-back attitude about the order of routines to accommodate cloggers needing to go back and forth between ballrooms. It made for a pleasant day, with no need to be stressed about quick costume changes. Making new friends is a great part about clogging competitions! Fancy Free Cloggers will be looking forward to seeing Neveah from Taps In Motion (and her mom) at the next one! It's probably difficult to read in this photo, but did anyone else find this sign hilarious? I chuckled every time I left the backstage area! Google won't even tell me what it means, so please enlighten me if you know! The awards ceremony did bring Fancy Free Cloggers some trophies to take home. We had a very respectable performance, especially considering last-minute changes due to an injury. We also brought home great memories! Congrats to all the winners! THANK YOU to our fellow cloggers and the folks in charge for a wonderful competition! 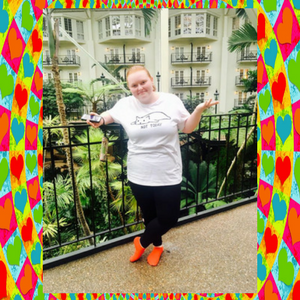 Have YOU been visited the Opryland Hotel? What was your favorite thing about it? Newer PostClogging love across the miles!